Ken Ham continues to beat the drum over record-breaking attendance at the Ark Encounter and Creation Museum. On a nearly weekly basis he claims record-breaking crowds. He shows videos and pictures of people pouring into his attractions. He continually posts rave reviews of the Ark and Creation Museum. As visionary of both of these tourist destinations and chief spokesperson we should expect nothing less than his unfailing cheer-leading effort including a vigorous defense of his enterprise. Is Ken Ham misleading the public and more importantly his followers about the attendance at the Ark Encounter and Creation Museum? I don’t think so. His promotion and defense of the Ark Encounter seem well within ethical bounds, notwithstanding the strange events surrounding the tax status question. There are plenty of naysayers that would like to see the Ark Encounter and its real parent company Answers in Genesis fail. There has been many articles written about the Ark attendance not meeting expectations and predicting imminent failure. You can count me as one that believes that Answers in Genesis does more harm to the spread of the gospel than it does good. However, even though Answers in Genesis are experts as creating alternative facts, there is no reason to believe that the attendance figures they report are anything but representative of the real attendance numbers. And those numbers aren’t as bad as some make them out to be. It has been reported that that over 1 million visitors made their way through the Disney-like Noah’s Ark replica the first year. That is below the hoped for 1.4 to 1.8 (or higher depending on who you talked to) million projections. Ken Ham and his associated have explained why attendance might not have hit projections. These explanations are quite reasonable though I have to wonder why these problems were not foreseen and included in the original projections for first year attendance by their marketing firm. I might suggest that they may want to consider not trusting that firm any longer since most of us could have predicted these problems well before the ark opened. I’ve recently wrote about what I think of those first year numbers (see: A Million and Counting). I think these numbers aren’t as bad as the critics are making them sound and they are certainly not the numbers that put the Ark Encounter in danger of bankruptcy even if they are disappointing to the Ark Encounters bond holders. I would characterize the Ark Encounter as a moderate success to this point. It has neither exceeded expectations nor has it been a failure. Nonetheless, the question before us now is: what is the future of the Ark Encounter? Ken Ham in his boundless optimism continues to project much higher attendance in the future. Even if they didn’t reach their mark last year, they will achieve their goals if not more if you listen to his rhetoric. But I’m more interested in what the numbers can tell us than the rhetoric. Fortunately we do have a few numbers to examine though the full picture is known only to the owners of the Ark Encounter. As I said before, Ken Ham almost weekly trumpets the record-breaking weekend attendance numbers. So he has provided us with some data which we can use to make some estimates about attendance and future prospects. Before I make my projection for attendance this summer and going forward, let’s look at the data Ken Ham has provided: I provide relevant Facebook and Twitter comments he has made during the summer with some brief notes and then we will use these numbers to draw up an attendance estimate. The Ark Encounter continues to break attendance records-over 8,000 on Saturday and over 11,000 at the Ark and Creation Museum combined–crowds love the rainbow lights. Topping 8000 visitors in one day does seem to be a high water mark, not just for this particular date. Its impressive but still less than half of what they had hoped would be a single-day attendance record (see below). These numbers are record breaking with respect to more attendees than the same date the previous year but we should not confuse the term record-breaking for exceeding expectations. They are not close to what they had hoped. 8,000 people at the @ArkEncounter & over 3000 at the @CreationMuseum today – this is the Ark parking lot at 2 today. Over 11,000 at both. 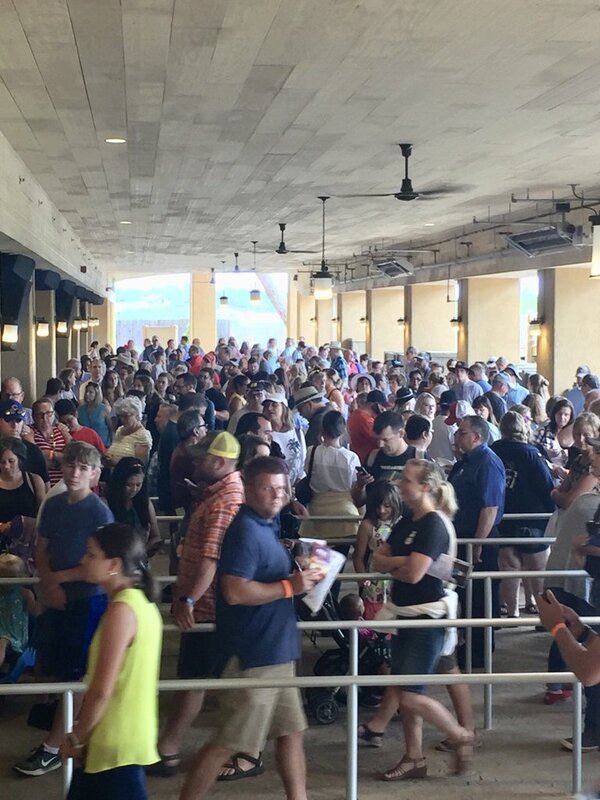 Upwards of 30,000 visitors at the @arkencounter and @creationmuseum over the July 4th long weekend. Note: July 4th weekend was Sat July 1 through Tuesday July 4th. So that is average of 7500/day for the Ark Encounter and Creation Museum combined. Some of these are the same people counted twice. Based on the split between the two at other times I would say this was an average of 5600/day for the Ark Encounter and 1900/day for the Creation Museum. Note: From this tweet we learn that of the 10,000 visitors on the 25th, 7500 visited the Ark Encounter. This along with several other references gives us our benchmark of 75% AE/ 25% CM for attendance breakdown when Ken Ham just gives us a total for both attractions combined as he usually does. Note: Before June 25 all of Ham’s references that I have found refer to “thousands upon thousands” of visitors. I think we can take from this that before the June 24th Saturday, there had not been a day that exceeded 10,000 visitors at the Ark and Creation Museum otherwise he would have surely promoted that fact as he has so vigorously after the 24th. Since writing this post Ken Ham continues to say that record numbers are pouring into the Ark Encounter. By that he probably means that more came this year than last year the same date but as we see here probably only 6000 visited this past Saturday. That number is well below the value I used in the calculations below showing that I have derived a very optimistic attendance figure. What can we learn from this data provided by Ken Ham? First, we know that Saturday is always the best attended day since this is almost the only day he ever reports attendance for. This is no surprise since both attractions have reduced hours on Sunday and some of their target audience probably object to driving and attending on a Sabbath. In the past when he has provided a whole weekend number I’ve gotten the impression that Sabbath attendance is at best 2/3 if not less than that of Saturdays attendance. Secondly, we learn that attendance has been generally increasing over the summer though not dramatically. Most Saturdays for going on two months now have seen about 10,000 visitors between the AE and CM. Third, the July 4th four-day weekend almost certainly represents the best four day stretch in the existence of the Ark Encounter. My estimated average attendance of 5600/day at the AE thus represents the best case scenario for the Ark for a whole year. That will be our upper estimate: 5600 x 365 = 2,044,000. They could crack 2 million visitors if every day were like a July 4th holiday extended weekend. Fourth, the stated claim that 1 million visitors entered the ark the first year is possible given the numbers Ken Ham has reported periodically throughout the year. Here is my optimistic yet realistically approachable approximation of attendance going forward if the recent past is a good predictor of the future. Four summer months (June through September): Lets be optimistic and assume that every weekend during the summer they achieve the highest numbers: 8000 on a Saturday and we will guess – again very optimistically – 6000 on a Sunday. That is 14,000 per weekend. I’m going to use simple math and assume 16 weekends. That gives us 224,000 visitors on summer weekends. What about the weekdays: I have talked to multiple people that have visited during the week and it is obvious that the attendance is much lower on weekdays with Friday picking up some. Let’s be optimistic again and go with 4000/day. That would be 20,000/week and over 16 weeks that would account for 320,000 visitors. For the summer (including September) the optimistic estimate is 544,000 visitors. For the rest of the year, there will be some good weekends but none that will hit those summer numbers except possibly a special event for Thanksgiving or Christmas. There will be months when 3000 visitors on a Saturday will be a good day. We don’t have as much data to work with here because Ken Ham didn’t provide us with numbers for the typical weeks, probably because the numbers would not be impressive. More important than high-attendance days would be to know what days had the fewest number of attendees but we aren’t likely to ever hear about those days. Considering that during the off-season there have been and will continue to be many days below 1000 and with only a few that have 5000 I will make an optimistic guess of an average of 3000/day. Eight months x 30 days/month is 240 days. 240 days x 3000/day provides an estimate of 720,000 visitors. If we put these numbers together we get a grand total of 1,264,000 for the year. 3000/day in non-summer months feels like an overestimate to me based on the reports that I get about attendance from last year. If this were 2000/day then that would give us 480,000 and combined with 544,000 attendees in the summer would put us right at the 1 million mark they hit for the first year. They would need a 66% increase in attendance to get to 3000/day average. This optimistic estimate only gets us to a few hundred thousand more than visited the first year. Ken Ham thinks that more advertising and more tour groups will push the numbers up significantly. The current numbers seem to bear out that a million visitors in the coming year is highly probable and with any maintained increases through the next year a moderate increase very achievable. But going much over 1.5 million visitors would seem to be overly optimistic. But optimism isn’t something that Ken Ham is bound to run short on anytime soon. A year later it appears they have not topped 9,000 visitors to the Ark Encounter on any single day including those in the second year when the attendance was supposed to have grown. Once again, I feel I must say that not meeting these expectations does not mean the AE is failing miserably. After all, any attraction is going to oversell themselves prior to opening. It’s part of how sales are made. I never took the 2.1 million number that I heard preached at an AiG conference the year before the Ark Encounter opened very seriously. I knew it was designed to get people excited. It was a marketing plan to get enough people to come to get the AE off to a good enough start and allow it to grow. The Ark Encounter would appear to have a good year ahead but there are some headwinds it will face in the near future. There will be increased competition for evangelical vacation dollars when the Museum of the Bible in Washington D.C. and yet another Creation Museum in Dallas Texas run by a competing YEC organization, the Institute for Creation Research (see: New Creation Museum to Test the Limits of Donors and Attendees) opens its doors seeking the attention of virtually the same clientele. Despite these future challenges, I think that as much as many of us believe that the Ark Encounter runs counter to the advancement of the gospel, the rumors of its death are certainly premature. The nationally renowned America’s Research Group (ARG) estimated that over 1 million people would visit the Ark in year one. Now that we are in year two, the Ark predicts that since last year was not a “typical” year (e.g., we did not experience a full complement of motor coach tour buses, which has now exploded), 2017-2018 will exceed our first-year numbers and be within the 1.4 million to 2.2 million range estimated by ARG. He goes on to say that attendance in the first three months of the second year was 325,000 which exceeded the previous year at the same time but by my calculation only puts the AE on a trajectory toward about 1 million in the second year. Updates from 2018: Ken Ham has rarely mentioned any attendance numbers since last September other than “thousands and thousands.” However, on June 17, 2018 he makes mention of Saturday attendance. These numbers are lower than last year on this date and would again suggest my estimates above are overly optimistic. Memorial Day weekend began with well over 8,000 pouring into @ArkEncounter & @CreationMuseum These Christian themed attractions impact thousands daily for the truth of God’s Word & gospel, & significantly positively impact tourism, economy & employment in Northern Kentucky! This appears to refer just to Saturday’s numbers and he never mentioned the full weekend after it was complete. 8000 (ca. 6500 for Ark Encounter) is a good number but again similar to last summers numbers rather than a significant increase. This tweet is the typical response to suggestions that the Ark Encounter is not pulling in the numbers expected. However, this is opening on a a Saturday which is always the busiest day of the week. One would expect that 7000 people will visit this day and so the cue absolutely should be full. But like most tweets of Ham, they paint a very selective picture – the picture he wants you to see. He will not post apples to apples pictures at the same time on different days of the weeks or other months. 7000 would be a 500-person drop over last year in late June. So far this summer attendance has either been similar or a bit less than the year before. We have our first evidence of how the second year compares to the first. The first year they said that they had about 1.1 million guests (we are not sure what counts as a “guest”). If, after 2 years, they have now had 2+ million guests it is quite possible that they only had 900,000 to 1 million guests this past years. Had they had 1.4 million or more Ken Ham would have surely have said 2.5+ million guests in his tweet. I want to stress again that 1 million guests is nothing to sneeze at but I don’t think that it meets the qualification of “resounding success” nor does it—or any of the other data we know about—suggest that visitors “continue to increase.” The next year will be a make or break year with respect to the Ark Encounter’s long-term success. Last year and this year must have both been right around 1 million visitors with a slight increase this year or the reported combination number of 2 million would have been larger. The 20% increase in motor coach tours was apparently offset by fewer individual visits. This past Saturday we celebrated the 2 year anniversary of the opening to the public of the Ark Encounter themed attraction. Over 12,000 visited the Ark and Creation Museum this past weekend–that’s why hotel room demand in Northern Kentucky is 4 times the national average! Last year on July 9, a Saturday, Ken Ham said that 7000 visited the Ark Encounter. Here we learn that 12,000 visited the AE and CM over two days combined this year on the same weekend. That is approximately 9000 visitors to the Ark Encounter over two days. Saturday is always the far bigger day than Sunday so maybe 7000 visited the AE on Saturday. So year over year this weekend was no better and possibly a bit lower than the previous year continuing the trend observed so far all summer. I’m not sure if this is an all-time record for any date or for the same weekend the previous year. Last year he spoke about a new record on this same weekend in which they had over 8000 visitors so this could be a new high-water mark. A week later Ham reiterated the “record” for the previous satuday but never mentioned anything about that weekends attendance and so we can reasonable infer that it was lower than the same weekend in 2017. We’re excited to announce we shattered an attendance record at the Ark Encounter last weekend. On Saturday, August 4, 2018, we welcomed over 8,500 paying guests to the full-size Noah’s Ark in Northern Kentucky. Using the formula 75% AE and 25% CM we get over 11,600 visitors to the Ark Encounter for the weekend. My estimate of Sunday attendance as being far lower than Saturday is correct. In this case it looks like Sunday was about 3000 attendees to the Ark Encounter. Going back to my estimates in the text above I had assumed a generous 6000/Sunday attendance in the summer. I can see now I had overestimated. These numbers suggest that getting to one million attendees this year may be possible but is by no means a certainty. No mention of this being a record weekend. Again, these values are on par with last year at this time. This is the height of the tourist season and so this next two or three weeks are going to represent the high water values for the year. A patheos blog reported that public records real that the paid attendance for July was about 7000 fewer than the paid attendance the year before confirming that although Ken Ham has claimed more and more are coming, in fact the paid attendance is declining this year. This is the first mention of attendance numbers since August 6th. This equates to around 6000 visitors to the Ark Encounter on a Saturday which included special events. August 23, 2018. The numbers are in for paid attendance in September. Paid attendance was down almost 17% over 2017 with 69,207 tickets sold compared to 83,330 the year before. If the AE can equal last years numbers for Oct-Dec they are track for 800,000 paid visitors this year. Non-paid attendance might receive a boost since AiG mailed out over 500,000 free tickets along with Ken Ham’s recent book to all pastors in the United States. The hope is that pastors will come to the Ark and then return home and tell their congregations that they need to make the trip. 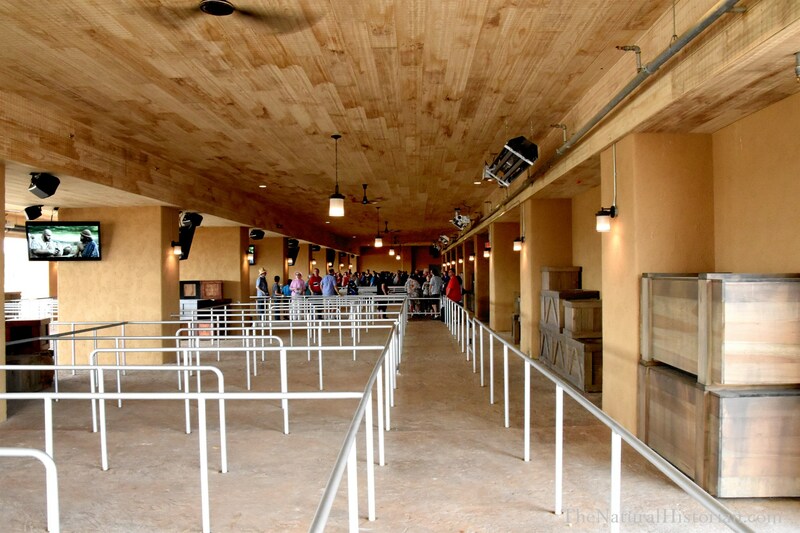 But the free tickets are also bound to eat into the total paid attendance for at least the next six months as many pastors will give the tickets to congregants that were intending to go anyone but now won’t have to pay thus costing the Ark Encounter in the short term. Yes, thousands are visiting the AE but no evidence of increased numbers which Ken Ham has been predicting for the past year. It is a bit surprising. The theme park grounds are far more attractive today than a year ago and the attractions have expanded greatly with a large auditorium to open in the spring. It should be a bit troubling that despite adding a large amount of infrastructure, along with its cost, that attendance is falling rather than growing. The park is built to handle nearly the double even the biggest attendance days that it has had this summer. At this point its hard not to be skeptical of the claim of “record crowds.” I expect Ham is not lying but the vagueness of this allows for record to not be as impressive as it might seem. This “record” cold refer to a single day though the words leaves the impression of the whole week. However, imagine if Saturday there were 3000 visitors and the previous year on the same weekend there were 4000 visitors, he could still claim that a record was set if his frame of reference is the exact same date. Last year the same date was a Monday and so comparing dates might result in a record for that date even though the whole week is down in total attendance. Their is a lack of clarity here but the hard data is what makes us skeptical. We know that real paid attendance has been down every month for four months and have little reason to believe it suddenly would be higher. We will have to wait until mid November to see if that trend continues. Stay tuned here for more information as it becomes available. 11/2/2018 – Ken Ham blogged about the fake new reporting of attendance being down. He is upset about the recent reports that attendance has been down the last two months compared to the previous year. He provides no evidence otherwise but repeats the claim that paid ticket attendance doesn’t reflect real attendance. No one is denying that this is the case but Ham doesn’t provide any other numbers and paid attendance is a good reflection on economic health. As I pointed about earlier, he has given out 500,000 free tickets along with children under 5 getting in free so overall attendance could be up a bit over last year but what we do know is that paying attendees are going down. Ken Ham’s Ark Encounter to Usher in a Modern-Day Reformation? Wasn’t there a blog post where Ham admitted only 800 or so a day during January and February? And how many freebies does AiG give out? I couldn’t find that post so I didn’t mention that though I had some memory of reading something similar. I don’t think they give a huge number of freebies out. They even charge full price for tour groups. But, there is probably many thousands that visited multiple times the first year that were donors to the building effort and so have lifetime or first year passes and so they aren’t getting entry fees from everyone and young kids are free and there are many families with small children that visit. So yes, the paying customers were some not insignificant number less than the total attendance number. Wasn’t the record attendance this weekend also the same weekend as the Chapman concert? Makes you wonder which was the big draw. Excellent point. I thought about that but then thought it was Friday night. I just looked and you are right. It was on Saturday. So yes, that would have certainly have pumped the numbers up some. So 7500 might still be the high water mark for a typical weekend. The latest Ken Ham tweet says, Now, 2+ million guests later. You can see why adult tickets got an increase of $8 and senior tickets an increase of $7, it’s the only way they can get an increase in income. Wow, great timing on that comment. I was just updating this post with that exact tweet! Yes, they say they had 1.1 million the first year so I doubt that they had more the second year otherwise he would have said 2.5+ or 2.3+ million. Its safe to say they didn’t have the large increase they predicted.